Combined observations from three spacecraft show that Jupiter's brightest auroral features recorded to date are powered by both the volcanic moon Io and interaction with the solar wind. At Earth, auroras are clearly driven by the solar wind that streams past the planet. 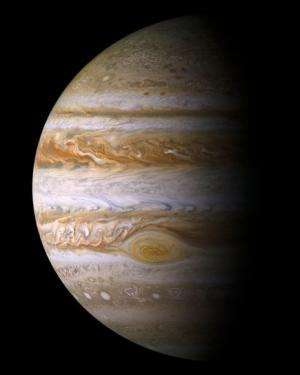 But Jupiter's gigantic auroras—magnitudes more powerful than those on Earth—are believed to be mainly driven by factors within the Jovian system. Now, by combining observations from three spacecraft, scientists from an international collaboration led by a researcher at the RIKEN Nishina Center for Accelerator-Based Science have shown that the picture is complex—volcanoes on Io, one of Jupiter's moons—and the most active volcanic body in the solar system—are responsible for powering some of Jupiter's brightest auroral features through interactions with the shock wave caused by the arrival of the solar wind. To perform the study, the group looked at data from three space-based sources—Japan's Hisaki satellite, an earth-orbiting extreme ultraviolet observatory that was launched into low-earth orbit in 2013, the Juno spacecraft, which entered into orbit around Jupiter in July 2016, and the Hubble Space Telescope, which took high-resolution far ultraviolet photos of Jupiter as Juno entered into orbit. By combining the data from the three spacecraft—including snapshots taken by Hisaki at ten-minute intervals for a period of more than six months, the team was able to more precisely map out the process through which the sulfur gas emerging from Io's powerful volcanoes is stored in the area far from Jupiter, transiently accelerated, transferred toward Jupiter, and channeled into Jupiter's polar region where it drives the aurora. These findings were detected during a "transient brightening" of Jupiter's aurora—with the phenomenon moving from the polar region toward the equator—that was detected in May 2016, as Juno was approaching. The data showed that the energy from Io's gas emission was somehow transferred toward Jupiter at a speed approaching 400 to 800 kilometers per second in the equatorial region of the space around Jupiter. Previous observations had been made combining the data from Hisaki and the HST had concluded that the solar wind had little to do with the transient auroras. "What is special about our observations," says lead author Tomoki Kimura, a Special Postdoctoral Researcher at RIKEN, "is that we were able to time the observations with the arrival of the Juno spacecraft into Jovian orbit. It turns out that Juno detected a shock wave originating from the solar wind, and this led us to infer that the solar wind was, along with Io, playing a role in the process by driving the energy toward Jupiter." In the past, it was generally considered that the magnetic field of a rotating astronomical body is powerful enough to completely dominate azimuthal movements of energy and mass near it, but the team's findings challenge this assumption, as the energy seems to move from the area far from Jupiter toward Jupiter.. Moreover, this process seems to hold for other rotating bodies such as neutron stars. Looking to the future, Kimura continues, "The Jovian system is known to contain several icy moons, namely Europa and Ganymede, which may potentially have extraterrestrial life in their underground oceans of liquid water, and the energy driven from the far area toward Jupiter could provide support for chemical processes on the icy surface of the moons. In the past we did not know how the energy was accelerated to such tremendous velocities, but now, thanks to these findings, we have a better idea. Now that Juno is in orbit around Jupiter, we will continue to receive new observational data that will help us pin down how the energy is transferred, again allowing us to gain insights in our search for life in those icy worlds." The work is published in Geophysical Research Letters. Not a word about plasma or electricity of course. The volcanoes and aurora are driven by electric currents, as usual they have the cart in front of the horse. Somehow is by those previously mentioned electric currents. They have believed this since Chapman promoted this 100 or so years ago in spite of Birkeland's experimentally based approach. Alas, the thought experiment fails again. Aw, how cute! the EU supporter doesn't even recognize that the solar wind is a plasma. Even non-EU supporters know this. Nice use of the CAPSLOCK button. Are you the new Cap'n CAPSLOCK? Oh, and regarding the 5 million amp electric currents you seem to be so proudly ignorant of, here you go. OK, so there is a plasma current between a planet and one of its moons. Last I heard, the planets are powered from the sun. Where's that current? It's okay to call it what it is, an electric current. Although they call them "magnetic portals" they too are electric currents. You keep bringing up this article as if it explains everything. If I am in an "EU" frame of mind, this seems like a short circuit to me. That being said, lots of bad things tend to happen with short circuits. If this did happen every 8 minutes and it is carrying the electric current your theory says it does, why do we not actively see the effects of this? We see the Aurora events, but should we see this huge spike in them every 8 minutes? Or is it simply because it isn't actually an electric current? Not really sure what you mean by "the planets are powered from the sun"
I guess you would assume it is a magical magnetic portal that springs forth from dark matter then? What exactly do you think this "magnetic portal" is then, if not an electric current. Last I heard you're not going to get said structure without a charged particle flow, i.e. an electric current. Since the article you linked to mentions the magnetic portals form by magnetic reconnection, you have now tacitly accepted the existence of magnetic reconnection. Good job! Just because the plasma ignoramuses go out of their way to avoid any mention of electric currents and circuits doesn't mean I adhere to their pseudoscientific mumbo jumbo. The important aspect of the article is the observation, not their perception. The important aspect of the article is the observation, not their perception. "The important aspect of the article is my made up interpretation of what I think they observed, not their actual science backed by theory, models and evidence." not their actual science backed by theory, models and evidence." ""Ten years ago I was pretty sure they didn't exist, but now the evidence is incontrovertible."" ""We were wrong. The connections are not steady at all. They are often brief, bursty and very dynamic."" "There are many unanswered questions: Why do the portals form every 8 minutes? How do magnetic fields inside the cylinder twist and coil? "We're doing some heavy thinking about this at the Workshop," says Sibeck." Yep, that's some swell science backed by theory and models that did not predict it and their a priori attempts to explain this observation with their "heavy thinking". @CD: Go ahead and name off all the EU predictions your EU theory has proven/disproved so far. Last I heard, you don't actually have any real predictions. You look at work scientists have already done, interpret it, and try to make it fit your EU model through the use of made up key phrases and ignorance. Oh, and the real scientists with theories and models that can be proven/disproved have math to back up the current state of their work. EU simply has observation of other peoples work and black and white pictures from one guys lab from over 50 years ago that they claim can explain everything. @CD: Go ahead and name off all the EU predictions your EU theory has proven/disproved so far. Start with two, the aurora are caused by "corpusal rays from the Sun" as predicted by Birkeland over 100 years ago based on observation and experimentation. He was ignored and mocked for decades by supporters/perveyors of the standard theory. In 1937 Hannes Alfvén predicted the presence of galactic magnetic fields, again mocked and met with scorn for decades until proven correct. The key being that the EU is only expounding upon known/experimentally supported aspects of real scientific priciples unlike the "heavy thinking" thought experiments to which you so gleefully adhere/believe.